As our lives get ever busier let Wag-A-Little's dedicated team of dog walkers lighten the load by taking your best friend out for regular walks. Daily exercise is essential to keep your dog healthy, as well as mentally and physically stimulated. Exercise not only improves your dog’s well-being, but also helps build muscle tone and prevents depression, obesity, joint problems, heart conditions and behavioral issues. 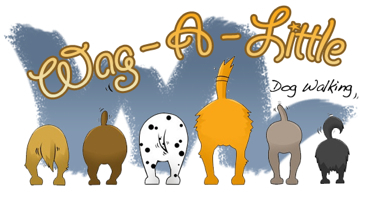 At Wag-A-Little, we walk our dogs in carefully chosen groups or packs. Socialization is enhanced on group walks and your dog will enjoy plenty of exercise and interaction by running around together in a safe environment. However, we're happy to arrange one-to-one walks for timid or difficult to control dogs. Walks last for a minimum of 15 minutes, up to a maximum of one hour. Please contact us to discuss your personal requirements; and remember to ask about our dog walking packages. A minimum of 15 minutes to a maximum of one hour, excluding travel time. Pick-up service at your home. ‘Run with the Pack ‘walks consist of no more than 6 dogs per walker. Whatever the weather, come sun, wind, rain or snow, we walk your dog. Wet or muddy paws wiped before home-time. Drop-off service at your home.